DALLAS - Red Sox general manager Ben Cherington spoke to a small group of Boston-area reporters in the lobby of the Hilton Anatole after baseball’s winter meetings ended yesterday. He then grabbed his bag and strolled past the front desk to a waiting car without being further interrupted. The cameras and microphones were chasing bigger stories elsewhere. The Red Sox were bit players this week, Cherington and his staff huddling in their cluttered fourth-floor suite contemplating cost-effective moves while teams like the Marlins and Angels were throwing bags of money at the best free agents. Cherington knew that would be the case. The Red Sox won the winter last year, trading for Adrian Gonzalez and signing Carl Crawford within a span of a few days. Those deals, and Gonzalez’s subsequent $154 million contract extension, limited how much flexibility the Red Sox would have this year. So while fans may be a little agitated at seeing other teams hold press conferences, Cherington isn’t concerned with the lack of activity. The Red Sox did take care of one piece of business when David Ortiz agreed to salary arbitration Wednesday night. Cherington has said for weeks that retaining Ortiz was a priority. Under the rules, Ortiz is considered a signed player for 2012. At worst he will have a one-year deal with a raise from the $12.5 million he earned last season. The sides also could hammer out a multiyear agreement that gives Ortiz some security and the Red Sox some added financial flexibility for 2012. 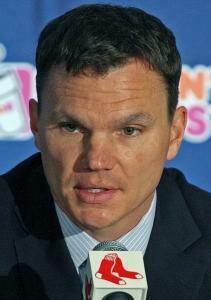 “There will be a lot more talks, because we have to get through the arbitration process,’’ said Cherington. “What the outcome of those are, I don’t know. Regardless, the return of Ortiz and the size of his salary could preclude the Red Sox from signing a player like Carlos Beltran or Michael Cuddyer to play right field. Josh Reddick or Ryan Kalish would be acceptable. That means pitching. The Red Sox still have gaping holes in their rotation and bullpen, and for now only theories about how to fill them. “We made progress, but nothing close,’’ said Cherington. “We’ll continue to do a lot of work. I think we have a good idea of what we may or may not be able to do. The loss of closer Jonathan Papelbon to the Phillies as a free agent left an opening that remains. Daniel Bard could fill the spot unless he becomes a starter. There could be a trade for a prominent closer such as Oakland’s Andrew Bailey. Free agency remains an option, as Ryan Madson, Brad Lidge, and Francisco Cordero remain unsigned. The Sox are willing to wait and let the market come to them. Cherington’s wait-and-see strategy has the support of team president Larry Lucchino. A year ago at this time, the Red Sox had their team of stars in place, and former general manager Theo Epstein was being hailed as a visionary. A third-place finish led to manager Terry Francona and Epstein leaving the organization. Cherington is left having to take a new, more methodical approach. It may not make headlines. But the rookie GM isn’t worried about that. “Being out front on things doesn’t always lead to the best outcome in the long run,’’ he said.